The Chronological Location of the Harvest – Its Object and Great Importance – The Focus of Time Prophecies – Preparations for the Harvest – Significance of the Convergence of Prophetic Testimony – The Lord's Presence – Reasonable Objections Answered – Entering the Joys of Our Lord. HE careful student will have observed that the period designated "The Time of the End" is very appropriately named, since not only does the Gospel age close in it, but in it, also, all prophecies relating to the close of this age terminate, reaching their fulfilments. The same class of readers will have noticed, too, the special importance of the last 40 of those 115 years (1874-1914), called "The End" or "Harvest." This brief period is the most momentous and eventful period of the entire age; for in it all the fruitage of the age must be gathered and disposed of, and the field, which is the world (Matt. 13:38), must be cleared, plowed and prepared for another sowing and reaping time – the Millennial age. The importance of the events of this harvest period can scarcely be overestimated; and yet the world will not be aware of it, until its potent though unrecognized agencies have accomplished their appointed work. Indeed, it is well to remember that this is not a harvesting of the whole world, but of the Christian Church; and it affects not Mohammedans, Brahmins, Buddhists, etc., but only the true [C122] Church of Christ, and such as are more or less associated with it – "Christendom." But while the world during the entire period will be in total ignorance of its character, yet in dread and fear of the outcome of its strange events (Isa. 28:21), the Lord's little flock of consecrated followers, now living, enjoy greater enlightenment than was ever the privilege of any of their forerunners; for in this period all the rays of prophetic testimony reach a grand focus, illuminating to the eye of faith the plan of God, including its developments, past, present and future. In his wisdom, God did not overpower them with the great flood of light now granted to the saints. Gently he led them on, step by step, cleansing them first from the papal pollutions which still clung to them. And as God thus drew them, the Sanctuary class followed on, recognizing the voice of the Good Shepherd in the accents of truth which exposed the old errors, until 1846, which prophecy marks as the date when a nucleus of the "holy people," the "Sanctuary," would become free from the errors of Papacy, cleansed of defilements, and ready to replace the unclean theories of men with the clean and beautiful principles of truth, on which the Lord and the apostles had founded the Church. Gradually they were led to expect the great culmination of blessing when the Lord himself should come, in the harvest of the age. Their diligent study of God's Word, and commendable desire to know what even the angels desired to look into (1 Pet. 1:12), were greatly blessed, though their desires were not fully granted. A faithful few were thus instructed in the Word of truth, filled with its spirit, purified and more fully separated from the world, purged of pride and, through the discipline of the disappointment of 1844, brought to more humble reliance upon God; and the foretold tarrying of thirty years developed in the holy ones patience, humility and loving submission, until the watchers at the end of the "1335 days" (1874, harvest time) received, and were sent forth to announce to all the Sanctuary class, the glad message, "Behold the Bridegroom!" And all of this class who hear, when they recognize its import, lift up their voices also, saying, "Behold the Bridegroom!" And this harvest message to the saints continues to go forth, and will do so, until it has reached all the consecrated and faithful. This intelligence is not for the world now, but only for the prospective bride of Christ. Our Lord is not the Bridegroom to any other class. The knowledge of his presence will come to the world in another [C124] way, and at a later time. None are now prepared to receive this truth, except the consecrated, the Sanctuary class. To the "host" of nominal Christians, as well as to the world, it is foolishness; nor will they be disposed to test the proofs set forth in the volumes of this series. Not only thus has the Lord prepared the hearts of his people and led them by ways which they knew not, but for this special time of need he has furnished wonderful helps to Bible study, such as concordances, and varied and valuable translations of the Scriptures, as well as wonderful facilities for printing, publishing and mailing the truth; and the advantages of general education, so that all can read and study for themselves, and prove to their own satisfaction all the doctrines advanced; and these under conditions of peace, so that none can molest them or make them afraid to exercise full liberty of conscience in so doing. After a careful perusal of the foregoing chapters of this and the preceding volume, the thoughtful reader will observe that while each of the time prophecies accomplishes a separate and distinct purpose, the central object of their united and harmonious testimony has been to mark, with definiteness and precision, by either direct or indirect evidence, or corroborative testimony, the date of our Lord's second advent, and of the establishment of his Kingdom in the earth; and also to mark the various stages and means of its establishment, during the harvest period. In order that we may realize the force of these various lines of prophecy in their bearing on these central truths, let us draw them to a focus, and note how these rays of testimony unitedly and harmoniously blend, clearly revealing the blessed fact, not that the Lord is coming, nor that he will soon come, but that he has come; that he is now present, a spiritual king, establishing a spiritual empire, in the harvest or end of the Gospel age, which laps upon the now dawning Millennial age. We have seen that there are to [C125] come "Times of Restitution of all things" – "Times of Refreshing" (Acts 3:19); we have seen also that the Lord Jehovah "hath appointed a day [the Millennial age] in the which he will judge the world in righteousness by that man whom he hath ordained, whereof he hath given assurance unto all men, in that he hath raised him from the dead" (Acts 17:31); we have seen that the Gospel age has been the trial time or judgment day of the Church, and that it ends with a harvesting, and the glorification of those who are to live and reign with Christ a thousand years – during the world's judgment day, the Times of Restitution; and we have also seen that the kingdoms of this world, under the prince of this world, Satan, must give place to the Kingdom of God, under the King of glory. All of these great events must tarry until the second advent of our Lord, the King, Bridegroom and Reaper, whose presence and work are to accomplish them, as foretold. The typical Jubilee cycles pointed out A.D. 1874 as the date of our Lord's return; and yet the date was therein so ingeniously hidden, as to make its discovery impossible until the "Time of the End." And this testimony was made doubly strong by proofs from two standpoints – the Law and the Prophets – the two being entirely independent of each other, and yet equally clear and convincing. The wonderful parallelism of the Jewish and Gospel dispensations taught us the same truth with additional features. The second advent of our Lord in the end or harvest of the Gospel age, occurring in the fall of 1874, proves to be at a point of time exactly parallel to the time of his first advent, in the end of the Jewish age. (See Table of Correspondencies, Vol. II, pages 246 and 247.) As every prominent feature of the Gospel dispensation is marked by a corresponding parallel in that typical dispensation, so we find that this most noteworthy event taught by the jubilee has its corresponding parallel. Our Lord's presence as [C126] Bridegroom, Reaper and King is shown in both dispensations. Even the movement on the part of the virgins going forth to meet him, their disappointment and the tarrying time of thirty years find their parallel both in time and circumstances. 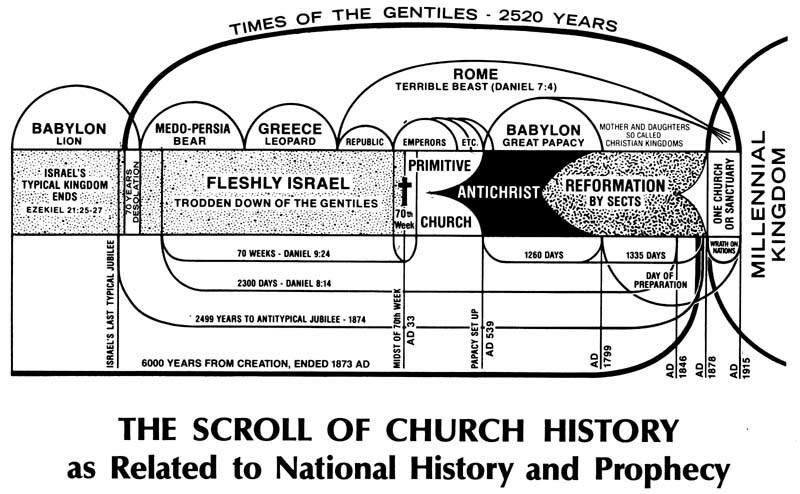 And the parallelism continues to the full end of the harvest of this dispensation – until the overthrow of the professedly Christian kingdoms, really "kingdoms of this world," and the full establishment of the Kingdom of God in the earth after 1914, the terminus of the Times of the Gentiles. (See Vol. II, chapter iv.) This coming trouble and overthrow, we have seen, had its parallel in the destruction of Jerusalem and the complete overthrow of the Jewish polity, A.D. 70 – another parallel, corresponding in both time and circumstances. Again, we have found the second advent of our Lord indicated by the prophet Daniel (12:1), yet in such a manner as to be under cover until the events foretold to precede it had transpired and passed into history, when we were led to see that the one veiled under the name Michael is indeed that which the name indicates – God's representative – "The Great Prince." Yes, we recognize him: "The Prince of the Covenant," the "Mighty God [ruler]," the "Everlasting Father [life-giver]" (Dan. 11:22; Isa. 9:6), who is to "stand up" with power and authority, to accomplish the great restitution of all things, and to offer everlasting life to the dead and dying millions of mankind, redeemed by his own precious blood. And, having traced the 1335 days of Dan. xii, down to their ending at this same date, we can now understand why the angel who thus pointed out the date referred to it in such exultant terms – "Oh, the blessedness of him that waiteth [who is in a waiting or watching attitude] and [C127] cometh to the thousand, three hundred, five and thirty days!" – A.D. 1874. * And in our reckoning of the symbolic times here given, let it not be overlooked that we used the key furnished us by the manner in which the first advent was indicated – a symbolic day representing a literal year. Thus we found the time of our Lord's second advent clearly proven to be 1874 – in October of that year, as shown in Vol. II, chap. vi. *The year as reckoned by the Jews begins in October; hence October 1874 was really the beginning of 1875. But this is not all. Certain reasonable obstacles to faith in Christ's presence might yet appear to the minds of even careful students, and we wish to see these all removed. For instance, it might reasonably be inquired, How is it that the exact Bible Chronology points to October 1872 as the beginning of the seventh thousand years, or Millennium, while the Jubilee Cycles show October 1874 to be the date of our Lord's return and the beginning of restitution times? This apparent inharmony of the date of the second advent with the beginning of the seventh thousand years seemed at first sight to indicate "a screw loose" somewhere in the chronological reckoning, and led to careful re-examination of the subject, but always with the same result. Closer thought, however, proves that God is an exact timekeeper, and that this point is no exception to his mathematical precision. It will be remembered that the reckoning of chronology began with the creation of Adam, and that some time was spent by Adam and Eve before sin entered. Just how long we are not informed, but two years would not be an improbable estimate. Before the creation of Eve, Adam was permitted to live long enough to realize his lack of a companion (Gen. 2:20); he had become acquainted with and had named all the animals; he had become acquainted with the various trees and plants of Eden. Then [C128] followed the creation of Eve; and some time must have elapsed in the enjoyment of their delightful surroundings, before the blight of sin entered. Recalling all these circumstances, we can scarcely imagine that a shorter time than two years elapsed in that sinless condition; and the interval between the close of the six thousand years and the beginning of the times of Restitution leads to the inference that the interval between the creation of Adam and the entrance of sin, during which God's Kingdom was in the world, represented in Adam, is not counted as part of the six days of evil. The six thousand years in which God has permitted evil to dominate the world, prior to the beginning of the great seventh or sabbatic thousand, or Times of Restitution, dates from the entrance of sin into the world. And since the Times of Restitution began with October 1874, that must be the end of the six thousand years reign of Sin; and the difference between that and the date shown in the chronology from Adam's creation represents the period of sinlessness in Eden, which really belongs to the reign of righteousness. Again, what might at first thought have appeared a discrepancy – that the Lord would be present in the close of 1874, and yet that Gentile Times would not end until 1914 – is found, on the contrary, to be in fullest harmony with the unfoldings of God's plan for the campaign of the Battle of the Great Day, and exactly as foretold by Daniel (2:44), who declared, "In the days of these kings, shall the God of heaven set up a Kingdom, and it shall break in pieces and consume all these." It must, therefore, be just as we have found it: our Lord must be present, must test the living members of his Church, must exalt them, glorify them and associate them with himself in the power and authority to be exercised during the Millennium (Rev. 5:10; 20:6), and must put in motion those instrumentalities and agencies which (though unconscious of it themselves) will [C129] carry out his orders – thus doing their share in the "battle of the great day of God Almighty" – undermining and finally overthrowing all the present "Christian Nations," so-called. The "kingdoms of this world," even while being crushed by the Kingdom of God, will be quite ignorant of the real cause of their downfall – until, in the close of this "day of wrath," the eyes of their understanding shall open, so that they will see that a new dispensation has dawned, and learn that Immanuel has taken to himself his great power, and has begun his glorious and righteous reign. While the time prophecies thus point to and harmonize with 1874 as the date of our Lord's second presence, assuring us of the fact with mathematical precision, we find ourselves overwhelmed with evidence of another character; for certain peculiar signs, foretold by the Lord and the apostles and prophets, which were to precede his coming, are now clearly recognized as actually fulfilled. We see that the promised Elias has indeed come; that his teachings have been rejected, just as predicted; and that therefore the great time of trouble must follow. The predicted Man of Sin, the Antichrist, has also made his appearance, and accomplished his long and terrible reign; and at the exact "time appointed" (1799) his dominion was taken away. The cleansing of the sanctuary was also accomplished as predicted, and at a time sufficiently in advance of 1874 to make ready "a people prepared for the Lord" – a people in devout expectancy of his coming – just as a similar work prior to the first advent made ready a people to receive him then. We find that the date 1874 is also in harmony with the prophecy of Daniel (12:1), which fixes the advent of "Michael" in the "Time of the End" – that is, somewhere between 1799 and 1914 – and as the cause and precursor of the great time of trouble. When seventy-five years of this "Day of Preparation" had developed the proper conditions for [C130] the beginning of his great work, then the Master stepped upon the scene – quietly, "without outward show" – "in like manner" as he went away. And the remaining forty years of this "Day of Preparation," sixteen of which are already in the past, will accomplish the setting up or establishment of his Kingdom in power and great glory. 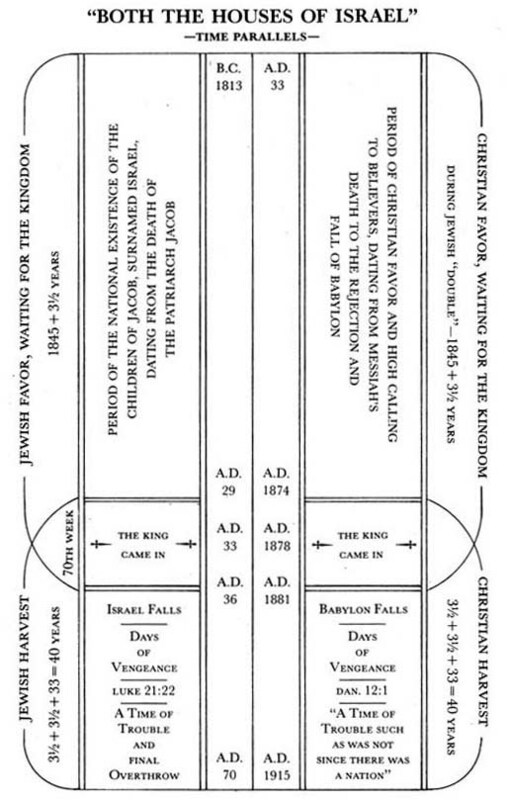 The focus of time prophecy upon the harvest and matters connected with the Lord's presence and the establishment of the Kingdom, will be impressed upon the mind by a careful study of the accompanying diagrams, one of which shows the parallels or correspondencies between the Gospel age and its type, the Jewish age, and how the various prominent features in this harvest are marked by the great prophecies, while the other concisely shows the history of the world as related to that of God's typical and real churches (Jewish and Gospel), and points out the prophetic measures relating to them. And now he has come! The Lord is indeed present! And the time is at hand for the setting up of his Kingdom, and the exaltation and glorification of his faithful bride. The days of waiting for his presence are now in the past, and the blessedness of the waiting ones, long foretold, is ours. To the eye of faith he is now revealed by the prophetic lamp (2 Pet. 1:19); and, ere the harvest is fully ended,* faith, and the present joys of faith, will give place to the rapturous joys of the full fruition of our hopes, when those counted worthy will all have been made like him, and will see him as he is, face to face. *The "end" of the harvest will probably include the burning of the tares. As shown in the parable illustrating it (Matt. 25:14-30), the first thing done by the Lord on his return is to call his servants and reckon with them. In reckoning with the servants who had made faithful use of their talents, seeking to know and to do his will, the parable shows that each one, as soon as examined, tested, is caused to "enter into the joys of his Lord," before he receives the dominion promised. Now we see that parable fulfilling, and that before our share in [C134] the reign begins. Even before the enemies are conquered, each faithful one is permitted to get a clear view of the coming Kingdom and glory and of the great work of the dawning Millennial day; and this view of the great restitution shortly to be accomplished for all mankind, through the instrumentality of Christ and his glorified Church, is the joy of the Lord in which they are permitted to participate. While we thus stand, as it were on Pisgah's heights, and view the grand prospect just before us, our hearts rejoice in the Lord's great plan, with an unspeakable joy; and though we realize that the Church is still in the wilderness of her humiliation, and that the hour of her actual triumph has not yet fully come, yet, seeing the indications of its rapid approach, and by faith already discerning the Bridegroom's presence, we lift up our heads and rejoice, knowing that our redemption draweth nigh. Oh, what fulness of blessing and cause for joy and thanksgiving this truth contains! Truly, the Lord hath put a new song into our mouths. It is the grand anthem, the first note of which was sung by the angelic choir, at the birth of the infant Jesus – "Behold, I bring you good tidings, of GREAT JOY, which shall be unto all people." Thank God, its harmonious strains will ere long fill heaven and earth with eternal melody, as the blessed work of salvation – restitution – which he comes to accomplish progresses toward its glorious culmination. "Joy to the world! the Lord is come! And wonders of his love."